Happy? That’s just the half of it! 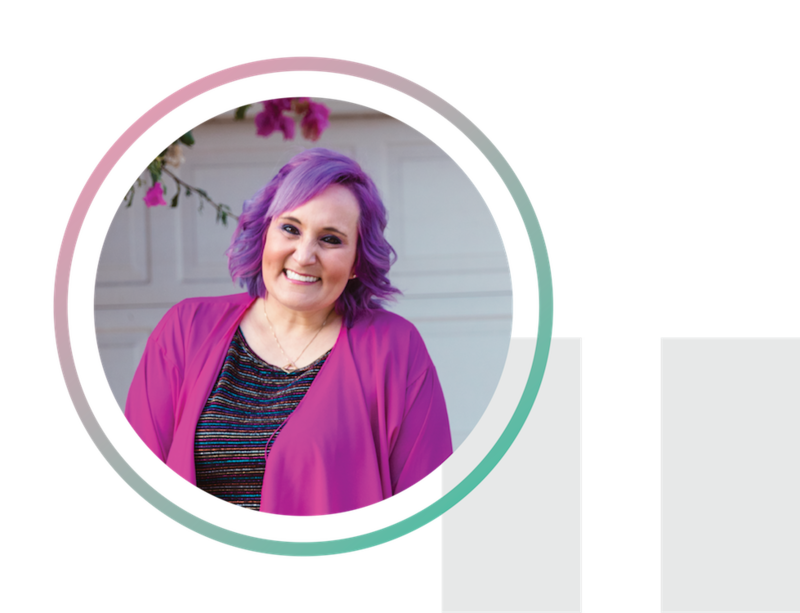 Meet Traci Banister, AKA Happy Traci—one of LuLaRoe’s hardest working Retailers and probably one of the coolest people you’ll ever meet. Known by many as someone who embodies positivity and encouragement, Traci has seen her share of tough times; and although she faced such overwhelming adversity, she knew it was up to her to choose happiness. Check out our interview with Happy Traci and see just what it takes to find one’s happiness. Would you mind telling us about an event that has shaped your life and what you've learned from it? So, I used to be an athlete. I was really into working out and I used to run half marathons all the time. I was the kind of person that would wake up in the morning and run a 5K or a 10K for fun; and then go workout in the gym and do bodybuilding. I was so into it. Then, one day, I just started getting sick. I got the flu and never got well again. It was so debilitating in the beginning. My body just started deteriorating—like losing the ability to walk. After many doctor visits and test after test—it was discovered that I have degenerative disc disease, fibromyalgia, arthritis, chronic fatigue, and chronic migraines. I pretty much have all the things [laughs]. I have to look at a list on my phone to remember everything that I’ve been gifted. With the chronic fatigue, I have to sleep more, so that's just part of my life. With the chronic migraines, I have to deal with that through medications. For the fibromyalgia, my skin is really, really sensitive and I have to take medications. They make me gain weight; which for somebody who's really into working out and fitness—that's really scary, you know? What can you do? That’s life and you gotta deal with it the way it is. You gotta move forward. Instead of being upset and crying about it, and being unhappy, I choose positivity. You can't choose what happens to you, but you can choose your attitude about it. And I just choose to deal with it and move on. You just do what you can do. That is the path I've chosen. I can't really leave my house as much as I’d like. So I don't have a lot of outside contact with the world—other than my Starbucks barista [laughs], and the people where I get my acai bowls from. My LuLaRoe business gives me the ability to go live every day. The ability to connect with other human beings and talk to people when I otherwise wouldn't have—that keeps me alive. You have a nickname. Would you mind sharing what it is, how you got it, and who gave it to you? What's funny, is I actually gave it to myself [laughs]. I was actually Happy Traci when I was really into fitness. It was who I was. And I don't even know why I gave it to myself, which is really funny; I just felt that it represented me to my core. I was Happy Traci before I joined LuLaRoe, and I kept it when I gave myself my social handles. I thought it was just me! It's sort of your badge or your moniker in life. Yeah, I guess so [laughs]. I just chose that path. It was who I was before the disease, and I thought—it’s going to be me no matter what! Let’s transition a bit. How long have you been with LulaRoe? I started in May, 2017. So almost 2 years. It feels like it was so long ago. But man was I ready to go—I was so ready to sell. Let's talk about your business. Can you tell me what a typical day looks like for your business? I take my kids to school in the morning, and then I go home and get to work. I pretty much work from bed [laughs]. I work as long as possible and then do stuff in the shop. Once I pick my kids up from school, I get ready to go live and start selling. Sometimes I get ready as I’m talking to my VIP group. I'll ask them things like, "What makeup look do you guys want to see tonight?" And they'll give me feedback. It’s really a community. Once I’m ready, I'll take a picture of my outfit for an outfit-of-the-day post. Sometimes, I'll even post that the next day. We go Live every night and sell. It's rare that I let other things get in the way of me going live. I am committed to this. Even when my illness doesn't let me, I have people in my life that push me to do it! How many hours do you work a day in your business? When do you start? When do you end? I work constantly on my business, because I don't just view the people in my VIP group or the people that purchase from us as customers—I view them as friends. When I'm answering their questions, talking to them, and interacting with them on our page or in our group, it's not just answering the questions. It's talking to my friends. It's not always work. It's fun interaction. When I'm going live and doing my makeup, it's on the clock hours, but it's not. It doesn't feel like work. Today, I went live while I was doing some updates on my Retailer site and I was just talking to them while I was doing the updates. It doesn't feel like work; but technically, if I were working for Disney, I would be on the clock. I work a lot, but it feels like hanging out with my friends. What has LulaRoe helped you achieve? Well, I worked for Disney for 20 years. I actually had to leave Disney because of my illness, which was devastating—because Disney was my life. I love Disney so much. I'm a total Disney girl. There is a wall in my house of all Minnie Mouse ears, and it's not even all my Minnie Mouse ears; it's just the highlights section. We're huge, huge Disney people in my house. John's worked there for over 30 years. This will be his 31st year. After 20 years there, I had to go on medical leave because of my illness. I just wasn't healthy enough to work that job anymore. Sadly, even though they were ready to accommodate me medically, I just couldn't do it with the fatigue. What is amazing is that I can do LuLaRoe with my illness and it has replaced the income that I was making while at Disney. We were also able to get into a bigger place, which we weren't able to do on our income before at all. I don't have to be on state disability, which is amazing. And it's all because of my LuLaRoe business that this happened. In addition to that, I really feel LuLaRoe has saved my life—because I can talk to people every day. As an extrovert, like a psychotic extrovert that is housebound [laughs], what would I be doing if I were stuck in a house without the ability to grow and be me? I believe I would be in danger of severe depression if I were stuck in a house without an outlet and people to talk to—and something to wake up to and be joyous about. LuLaRoe gives me purpose. It might sound crazy, but it's giving me a reason to wake up every day, to get out of bed. It's really keeping me alive and I'm so grateful. Can you think of a story or one of your favorite memories from working your business? Absolutely! One of the most amazing things that we've done has been to help other families like ours. People have approached us and said, "Hey, we wanna sell LuLaRoe. We wanna sign up under you. We want you to be our Trainer." We're so humbled when that happens. We talk to them and bring them in, they become part of our LuLaRoe family. There is one family that’s part of our T.E.A.M. Their goal was to make enough money so that mom could quit her job and be home with her two little kids. After selling for two months, she was able to make enough money so that she could stay home with her kids. To be able to help her do that is the greatest thing that we can do—helping other people. That's why DeAnne does what she does to help other people. That's why she fights every day for this business. If we can help other people do that—to achieve their goals—how awesome is that man? [laughs]. Looking back, what advice would you give yourself when you were first starting out as an entrepreneur? If I could give myself advice, I would say, “don't waste money on things you don't need to start your business.” There are little things I thought I had to spend money on, that I didn't have to spend money on. LuLaRoe provides all the assets we need to get started—for free. I didn’t need to seek outside resources or to purchase unnecessary help when I got started. They're right here for us, for free. There are so many tools that LuLaRoe provides us. All we have to do is use them. What are your goals and dreams for the future and how does LuLaRoe play a role in that? Well, I have a sales goal I want to hit. We have a goal to own our dream home. We are going to have to stretch for that one. But we know it's attainable. LuLaRoe plays a part in that because, oh my gosh, it’s making it happen for us. This is the best time to be a Retailer, because every day—it gets better and better. I'm so grateful to be here, I feel like it’s magical. I am so happy we signed up when we did, and I'm so excited to see what's coming in the future. Is there anything else you would like to leave with the readers? I love my parents and they are so amazing, but I have always looked up to my Grandmother as my personal heroine! She was a female entrepreneur in the 70s and started her own business; and I grew up watching her be a business owner! She would create her own hours so she could pick me up and take me to school. She gave me a place to do homework and watch cartoons in her office. It was truly inspiring for me, and I’m now showing that to my daughters and instilling work ethic in them! What 3 words do you feel describe you the best? I am HILARIOUS. I should have been a stand up comedian! I am also ENTHUSIASTIC and AUTHENTIC! Instagram! I have met so many amazing people through Instagram, gotten so many laughs, and learned so many things! I love the quick snippets of information, ease of shopping and advertising, and ways to connect! I love reading about true crime, unsolved mysteries, and spooky stories. I read these types of stories every night before falling asleep! I love going to Disneyland. It’s truly my happy place! I like shows with a weird side. I really like anything to do with true crime and the study behind it. I also really like scary shows, especially because they terrify John (my husband). I really have fun laughing at him being scared! I have really enjoyed the recent series Mindhunter, Russian Doll, and You! I would be my own chihuahua, so I could spy on my family. She also takes lots of naps and we give her lots of soft blankets—so she has a really good life! Have you had the Butterfinger flavored yogurt at Yogurtland? It’s a candy bar…in frozen yogurt! EVEN BETTER! The Ghost in my house! Every few months, John and I go on a little trip by ourselves. We take time to just be alone and reconnect as a couple; because it’s so important to us, to stay on the same page and have time away from all of the business that life brings. We always come home feeling refreshed, happy, and ready to go full speed ahead! You can’t control what happens to you, but you can control your attitude about it. I choose to be happy! I would be a magic Genie and grant myself perfect health. How amazing would that be!? My toothbrush, my iPhone, a huge warm, soft blanket, Diet Fiesty Cherry Coke, and my chihuahua! My absolute favorite is Taylor Swift! I go to her concert with my daughter every time she comes to town. Other than her, I really don’t listen to music, funny enough. I LOVE podcasts and listen to them constantly while I work in my LuLaRoe space! We LOVE going to Disneyland as a family. John and I love going to the Disney Theme Parks in Florida without our kids, to connect as a couple and just have fun as grown-up kids! Our family loves playing with our crazy little dog. My daughters and I love taking special mommy-daughter time to go to Barnes and Noble and peruse all the books. If you ever see us out and about, say hi! You’ll hear my laugh before you even see me. Find out who you are, and be authentically you. While it’s great to find new income producing activities that you’ve seen work for others, doing things that are specifically your style are always going to be more rewarding and fulfilling for you personally and professionally. Really dig deep and figure out your 5 pillars…who you are, what drives you, what you want people to remember you by. And never be a “copy and paste” of someone else! You are AMAZING, you are SPECIAL, and YOU ARE LOVED! BE UNIQUELY YOU!